Children love to climb. Playgrounds are designed with climbing frames, monkey bars and rope ladders. Outside the playground who didn’t find joy as a kid climbing a tree or scrambling up a muddy gully. As you get older there is a general trend to start doing more “mature” sports, like trying to hit a little white ball into a hole with a stick, or spending hours underwater gazing at fish. Too often people forget the fun they had trying to climb up something just to see if they could. Rock climbing is not just for your proverbial bronzed Adonis who has no fear of heights, or in fact no fear of plummeting to his death. Admittedly there are those who have taken the sport to an almost Zen like level of physical training and mental conditioning. These are the men and women whom can be seen as tiny specks on the bare walls of Yosemite or scaling impossible overhangs in the European Alps. However rock climbing is also accessible to a much larger range of people, from those who want to make it a hobby or for those who would just like to have a go. For beginners, rainy days or just to find out about the local climbing area the first place to go should be to a climbing gym. Here you can get valuable advice and training about how to climb and more importantly how to do it safely. Starting on very low walls you learn how to use footwork to take the strain of your arms, how to balance and the uses of rock shoes and chalk. Then on higher walls you become familiar with ropes and harnesses before seeing how much of your youthful climbing skills you have remembered. Once on the wall you grab, grip, pinch and pull on the various holds trying to make progress upwards. Quickly your fingers tire and your forearms become “pumped.” If your energy reserves and strength last long enough you victoriously get to the top of the wall. Otherwise you tend to find yourself watching your fingers uncurl from the holds you are clinging to and then find yourself dangling mid air on the end of the rope. This tends to cause little more than a bruised ego and just like falling off a horse the best thing to do is to get right back on and try again. There are also opportunities in Okinawa to climb outside on real rock. “Bouldering” is a style of climbing where you try short difficult problems just off the ground without ropes. Although originally done more as a training method for bigger climbs, bouldering is now popular in its own right. 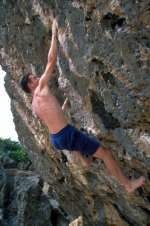 Longer climbs are possible in the North of Okinawa where the rocky cliffs around the Cape Hedo have become the favored areas for many of the island’s local climbers. Climbing outside or inside should only be done when you have the proper equipment and training. Rock climbing is something that can bring a lot of pleasure but also must be treated with respect and done as safely as possible. 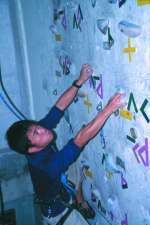 The Okinawa Yamacha climbing gym was set up in September 1999. It is located at the junction of route 330 and route 24 in Okinawa City. Beginner courses are offered on Wednesdays 8pm to 9pm but at other times instruction may be available on request. The gym is open Mon. to Fri. 4.00pm – 10.00pm, Sat. 1.00pm – 10.00pm, Sun. 10.00am – 7.00pm. A day pass costs 1,500 yen for an adult plus a one-time sign up fee of 500 yen, this includes all equipment rental. For more information please call Michi or Mr. Higa on (098) 982-2828.